Life is made up of moments, but too often we miss the moments in our attempts to grab onto the big things. The next thing we know, we've missed living life because we were always looking out ahead. Nichole challenges us to look in the here and now, to enjoy the moment we're in and to treasure each day. "Creating a table with joy at the center has very little to do with what's being served." "Holding on too tightly to relics and memorabilia can fool me into remembering things inaccurately. Everything was beautiful and easy. The babies slept soundly beneath the moon. I pureed organic carrots. What? Not even close." "Sometimes the only thing that turns an ordinary event into a special tradition is just calling it one." Besides being a good reminder to cherish the moments, the book itself is beautiful. A little hardback gift book size book with beautiful photographs of the cutest little children, it's nicely put together with spots for reflection and journaling. 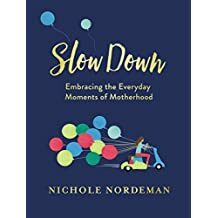 Looking for a gift for a new mom or a harried mom or just as a good challenge for yourself, I recommend this book. I received this book from Book Look Bloggers. I was not required to write a positive review.